About 400 people -- comprising the who’s who of Silicon Valley entrepreneurs and Venture capitalists -- attended Maitri’s annual gala at the Computer History Museum in Mountain View, California on February 8. The evening raised over half a million dollars for Maitiri, a 23-year-old organisation in the Bay Area that provides free and confidential services to help South Asian-American families facing domestic violence, emotional abuse, cultural alienation, human trafficking or family conflict. Maitiri offers peer counseling, transitional housing programs, legal advocacy, economic empowerment programs and more. In the last couple of years, Reddy said on the sidelines of the gala, Maitri has grown significantly. “There is such demand, a need for intervention,” explained Reddy, who is also on the board of directors at the India Community Center and the Foundation for Excellence and the Bay Area chair at Akshaya Patra, besides being founder, chair and chief executive officer of Global Industry Analysts, Inc.
“We have to work with our resources in a very intelligent way,” he added. The money from the gala, she said, will go to the Maitri Vintage Boutique, which employs destitute women. Maitri, Gupta pointed out, also serves men, seniors and children. One of the biggest donors at the evening was S Suresh, senior executive, Informatica Corporation, who donated $100,000. Suresh told India Abroad that he became aware of Maitri in 2009 when his wife Jaya started working for the organisation. “Every woman must have both financial and emotional independence; something every man takes for granted and has the luxury of enjoying all through his life,” Suresh said. ‘What made me feel very sad and wonder, is the lack of awareness,’ the diplomat added. Domestic violence, he said, is not specific to any community, race, religion, country, educational or economic level, but most of the time the victim is a dependent on the perpetrator. Dr Mukta Sharanpani, Maitri board member, recalled the dedication of Anjali Dujar, co-founder of Maitri, who died at age 48 when a rogue wave washed her away in Baja California last July. Dr Sharanpani urged the audience to become agents of social change. To create awareness about domestic violence among young people, Maitri last year started its Teen Workshop. The four-hour workshops are held monthly at schools in the San Francisco Bay Area, where students like Nisha Uppuluri and Simran Lubana talk to high school students on this issue. Nisha, 17, a junior at Mountain View High School, joined Maitri through the Girls Scouts. “I really liked the idea but I think the workshops weren’t able to get off the ground because it’s kind of hard for teenagers to listen when the adults were telling them everything,” Nisha told India Abroad. “Through the workshops I make so many connections to people of my age and of my culture and my generation. The workshop is not just focused on any particular group; it’s about teenagers across the Bay Area. There might be teens at the workshops who are struggling with things at home,” Nisha said. 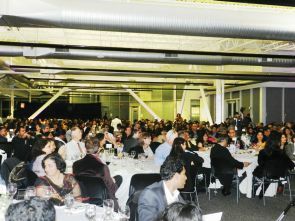 Image: Maitri’s annual gala at the Computer History Museum in Mountain View, California.